Growing cabbage is an easy and a hardy vegetable and does well in fertile soils. 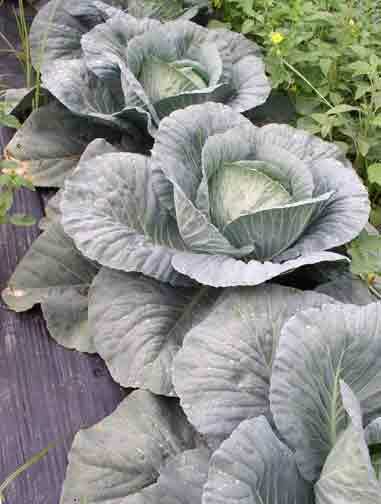 Cabbage tolerates a wide range of garden conditions and thrives in cooler temperatures. Cabbage can tolerate hard frosts, but severe freezes can be damaging. Cabbage is in the Brassica genus as well as Broccoli, Cauliflower and Brussels Sprouts. Pythium Damping-Off - This disease commonly affects seeds and young transplants and is caused by the soil-borne fungus. Downy Mildew - This disease is caused by the fungus Peronospora parasitica and can attack both seedlings and mature vegetable plants. Alternaria Leaf Spot - This disease is caused by the fungus, Alternaria species, and occurs during warm, moist conditions. Black Rot - Black rot is caused by a bacterium, Xanthomonas campestris pathovar campestris, and can affect all vegetables in the crucifer family. Black Leg - The fungus, Phoma lingam, causes black leg. Wirestem - The fungus, Rhizoctonia solani, causes wirestem. Fusarium Yellows - Yellows or wilt is a much less important disease today due to the development of varieties resistant to the disease. Viruses - There are several common viruses that can affect cole crops including Turnip mosaic virus and Cauliflower mosaic virus..
Cabbage is the fourth most grown vegetable in the U.S. yet we grow a small fraction of hundreds of varieties available. They are grouped by head shape, round and flat being the most commonly grown, and come in white, green, and purple. Taste varies by variety.